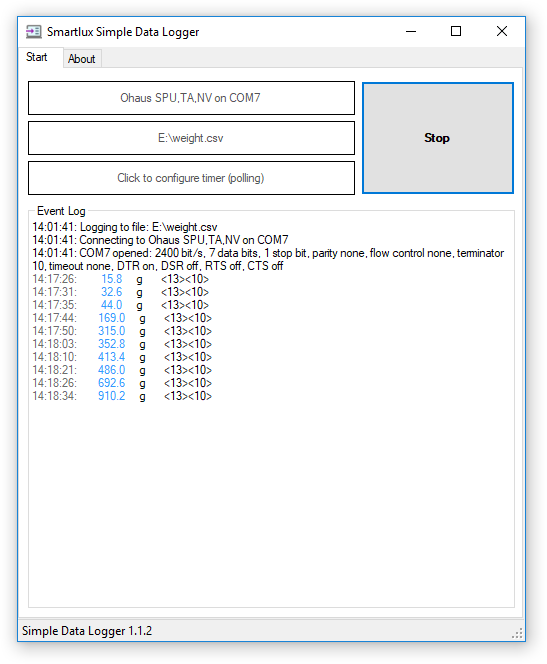 Simple Data Logger (SDL) writes the weight from your scale or balance to a CSV file on your PC (with date and time). It can also be used with other measuring instruments, bar code readers, etc. sending data in ASCII format. Connect your scale or balance to your PC. 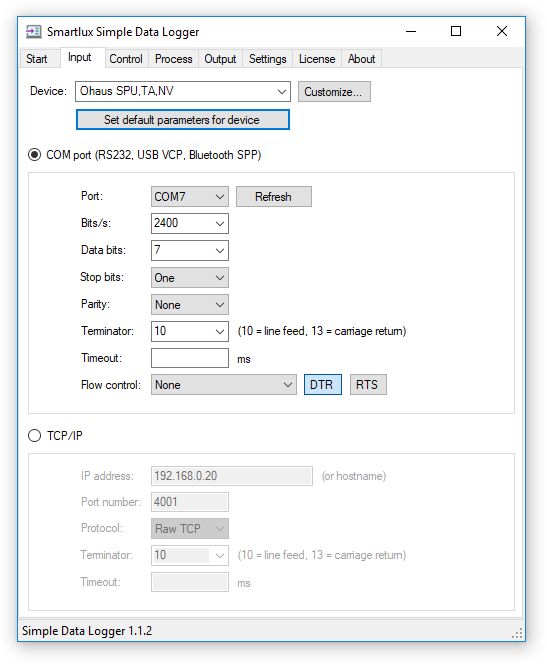 Our software supports RS232, USB (virtual COM port), Bluetooth SPP and TCP/IP (Ethernet, WLAN) connections. Our software writes the weight values sent by your scale to a CSV file. If required, it adds the date and time to each line. 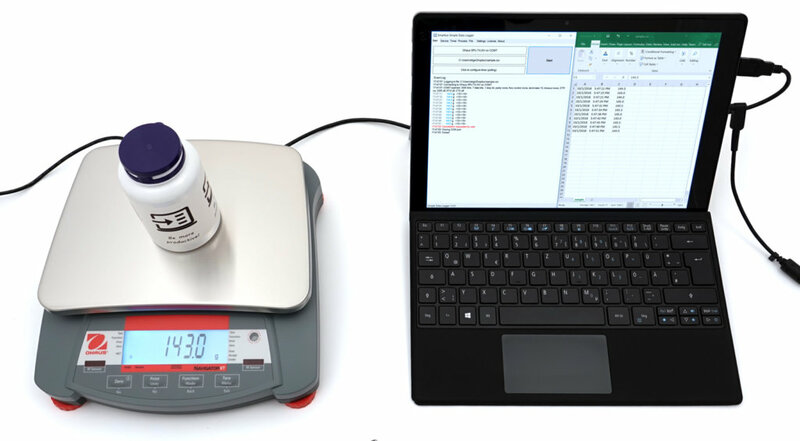 The Plus version can also add line numbers and a custom text and use a timer to request the weight from the scale. 4. 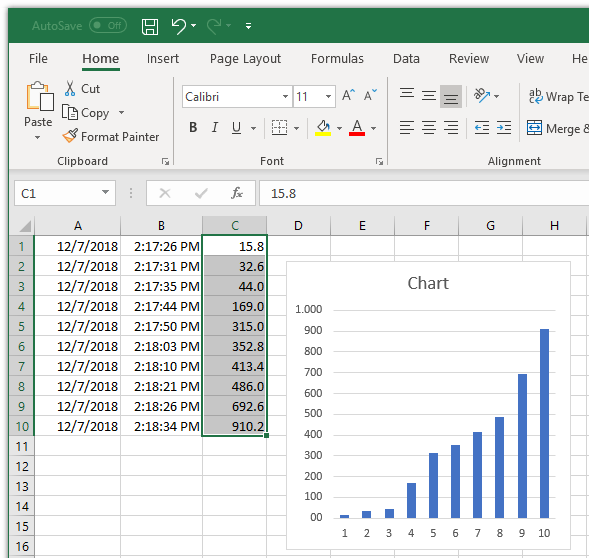 Open in Excel, OpenOffice Calc, Google Sheets, etc. Consult our documentation for further information on how to use Simple Data Logger. SDL is free for personal, non-commercial use. A paid license is required for all other purposes or to use the Plus features. Please refer to our EULA for further information. Please contact us if you require a trial license. Data sent by your device (e.g. a scale, balance, serial bar code reader, etc.) has to be in ASCII format. SDL can only capture one number (e.g. the weight) from each line of data sent by your device (or it can capture the entire line without formatting it). 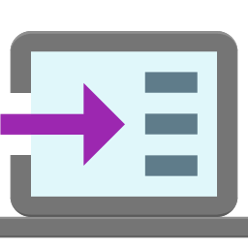 SDL cannot connect to more than one device at a time. If Simple Data Logger is too simple for your application, please have a look at our comparison page which contains links to similar software. SDL requires .NET framework 4.7, which can be installed on the following operating systems: Windows 10 (Anniversary Update or later, 32-bit and 64-bit), Windows 8.1 (32-bit and 64-bit), Windows 7 SP1 (32-bit and 64-bit), Windows Server 2016 (64-bit), Windows Server 2012 R2 (64-bit), Windows Server 2012 (64-bit), Windows Server 2008 R2 SP1 (64-bit).